Listen in to some frank talk about 10 issues on the minds of community pharmacists, along with some ideas about how to handle common questions and patient interactions in the pharmacy. 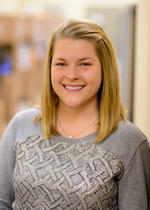 Jessica is a third-generation pharmacist and a 2014 graduate of the University of Minnesota College of Pharmacy. As a pharmacist with a communications background, she has found a unique niche in which she is able to educate, inform, and serve her patient community. When Jessica isn't in the pharmacy or hosting her weekly radio show, you can find her planning her next getaway, near or far, with her husband, friends, and family.